EUR/USD has broken 1.2442 and formed an upside continuation pattern; it has reached the target of another ascending structure at 1.2500 and right now is consolidating. Today, the price may fall to reach 1.2481 and then grow towards 1.2500, thus forming another consolidation range. If later the instrument breaks this range to the downside, the market may fall to reach 1.2442; if to the upside – continue moving upwards with the target at 1.2550. 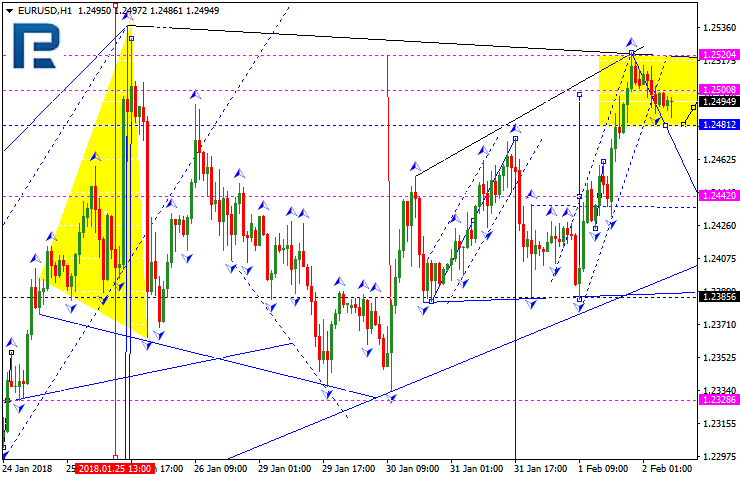 GBP/USD has broken 1.4217 and formed a continuation pattern. Possibly, the price may form another ascending structure with the target at 1.4300 and then fall towards 1.4217, thus forming another consolidation range. If later the instrument breaks this range to the downside, the market may fall to reach 1.3925; if to the upside – start another growth towards 1.4400. 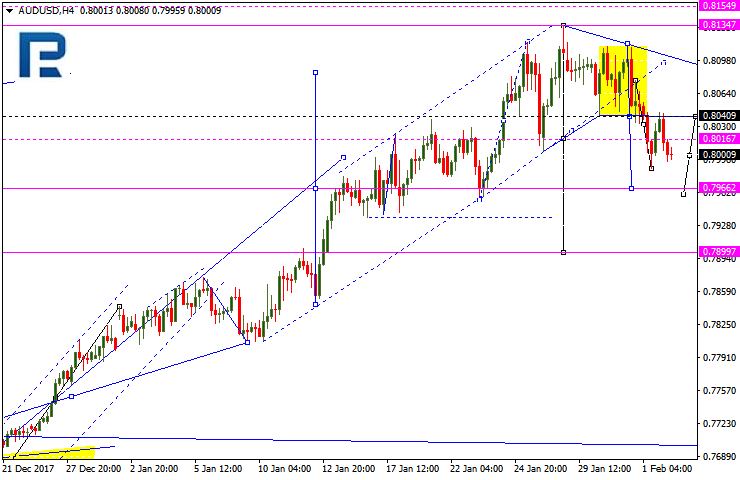 USD/CHF has expanded its consolidation range upwards and reached the target at 0.9257; right now, it is consolidating. Taking into account that the ascending impulse is weak, the price may yet update the lows and reach 0.9247 and then grow towards 0.9300, thus forming a new consolidation range. 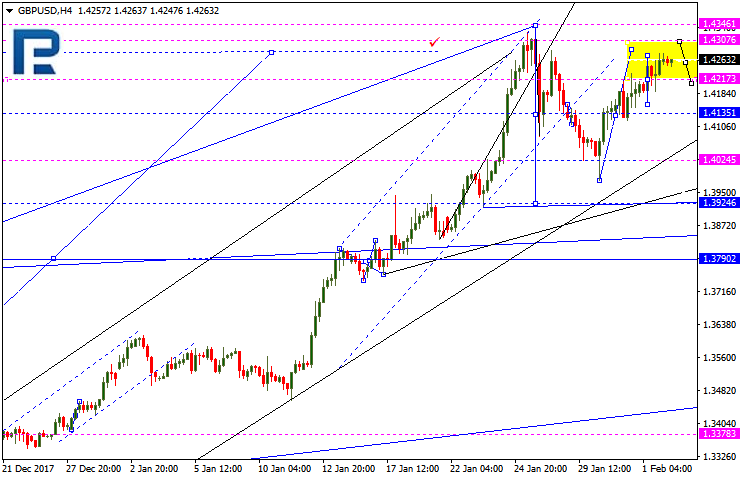 If later the instrument breaks this range to the upside, the market may continue moving upwards to reach 0.9460. USD/JPY has broken its consolidation range, formed an upside continuation pattern, and may start the structure towards 110.13. Later, the market may be corrected to reach 109.35 and then resume trading to the upside towards 110.45. This entire five-wave structure is considered as a correction. After that, the instrument may start a new decline to reach 108.14. AUD/USD has formed a downside continuation pattern. The short-term target is at 0.7966. 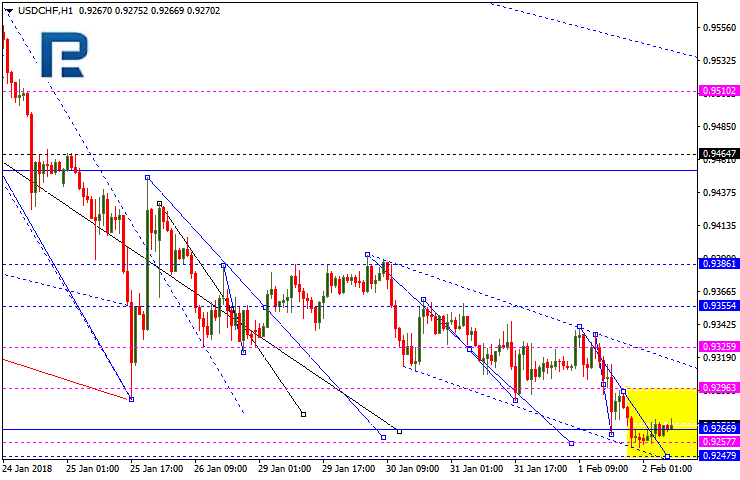 After that, the instrument may grow towards 0.8040 and then continue trading to the downside to reach 0.7899. USD/RUB is still consolidating near the lows. If later the price breaks this range to the downside, the market may fall to reach 55.26; if to the upside – start another growth towards 57.20. 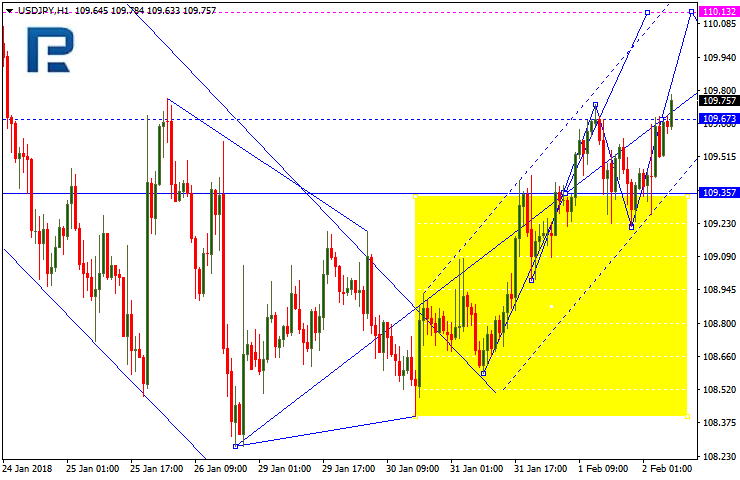 Gold has broken its consolidation range upwards and may grow to reach 1353.00. 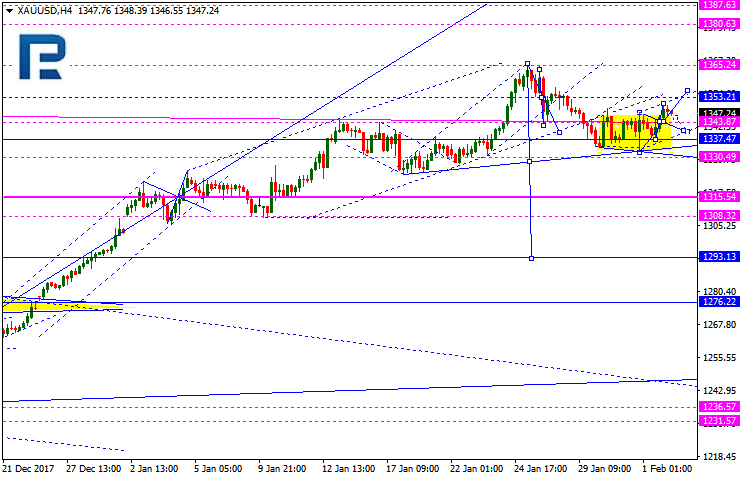 Later, the market may start another decline towards 1330.00. 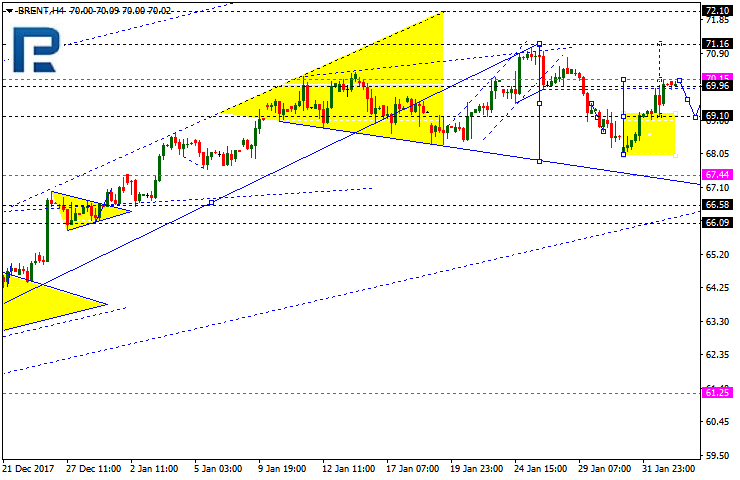 Brent has broken 69.10 and formed a continuation pattern. 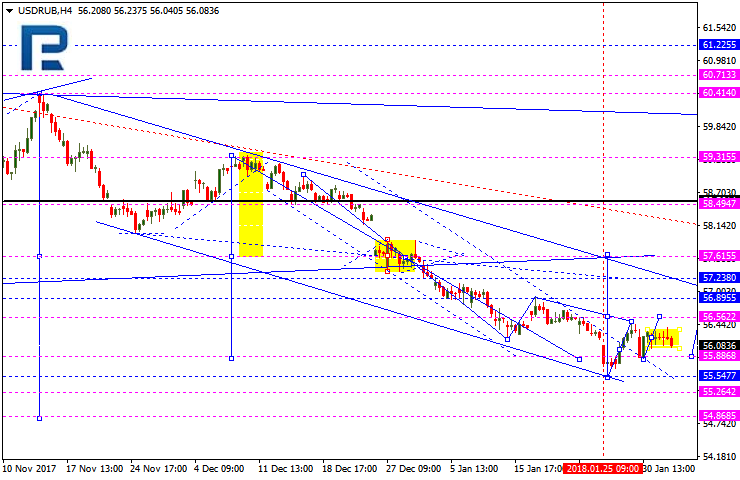 Possibly, today the price may grow towards 70.15, break it, and then continue moving upwards with the target at 71.15. After that, the instrument may start a new decline to reach 69.15.